Hail, Caesar! opens in Australian cinemas on February 25 and now showing in the United States. Distributed by Universal Pictures. Joel and Ethan Coen have penned the ultimate love letter to old Hollywood with Hail, Caesar! The film is a masterpiece in the eyes of those who are fascinated with the golden age of Hollywood, but with it's entertaining screenplay and stunning visual production can be enjoyed on a much larger scale by all audiences. It would seem that Hollywood studio fixer, Eddie Mannix (Josh Brolin) really has his work cut out for him today. His daily job consists of keeping the contract players of Capitol Pictures in line and making sure that the public continues to see them in the best light possible, especially with tabloid reporters, Thora Thacker and her sister, Thessaly (both portrayed by Tilda Swinton) prowling the studio. When one of their biggest stars, Baird Whitlock (George Clooney) is abducted during the filming of a production of epic proportions, Mannix must try and conceal the true nature of his disappearance as well as bide by his kidnappers demands. All this while making sure Capitol Pictures is still running smoothly around this scandal and that the stars, including starlet DeeAnna Moran (Scarlett Johansson) and cowboy turned drama star, Hobie Doyle (Alden Ehrenreich) are causing as little trouble as possible. Hail, Caesar! is absolutely immersed in references to the golden age of Hollywood. To truly understand the extent of how much the film is cleverly inspired by the Southern California film industry of the 1950's, one must already possess a certain amount of knowledge and fascination regarding this era. However, it is not a prerequisite to find incredible enjoyment in the film by any means. Hail, Caesar! is a great deal of fun with it's hilarious screenplay featuring colourful characters in the most entertaining of scenarios. 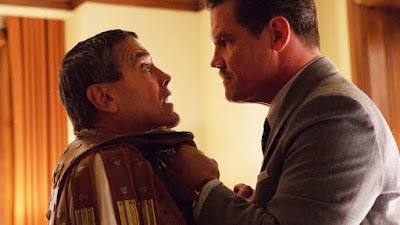 The Coen brothers screenplay is unique to their films because although there is the main storyline of Baird Whitlock's abduction, it is not the strong, solid heart of the film and this is fine because that's not what it's supposed to be. Hail, Caesar! is a portrait of Hollywood history in a time now long gone and doesn't focus on just one aspect, but instead focuses on the industry and it's inner workings as a whole. The nostalgic film with it's glorious production and costume design (by Jess Gonchor and Mary Zophres) is a mixture of old Hollywood fact and fiction. 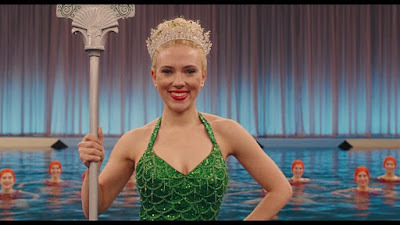 However, even the fictionalized aspects of Hail, Caesar! are based on and reference true to life elements of 1950's Hollywood. 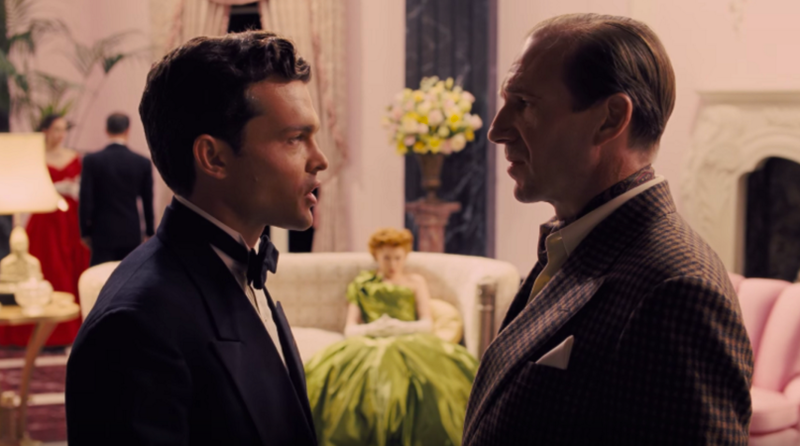 How much of old Hollywood that is acutely incorporated into the film visually and as part of it's screenplay is astounding and this would not have been able to so if Hail, Caesar! was only focused primarily on the Baird Whitlock abduction. Capitol Pictures is a product of the Coen brothers' imagination, but it is evidently based on the legendary Metro-Goldwyn-Mayer Studios (MGM) which is considered by many to have been the greatest of the old Hollywood studios. The fictional studio visually resembles MGM, particularly the side gates, but perhaps the biggest resemblance is the fact that MGM did indeed have a fixer by the name of Eddie Mannix who worked for the studio covering up many a celebrity scandal. However, the similarities between the real life Mannix and Josh Brolin's Mannix end there. While the Mannix of Hail, Caesar! is affable, likable and a man looking for a way to spend time with his family, the real life Mannix had to cover up more sinister events and earned an unsavoury reputation. He was personally linked to the death of Superman actor, George Reeves as his wife, Toni was having an affair with Reeves. Brolin's Mannix makes for a more appropriate hero in Hail, Caesar! with his strong conscience, as he wants to do the right thing and worries that his job prevents him from doing what is honest. 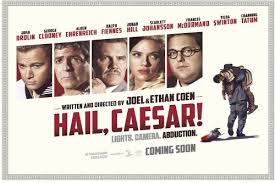 The Coen brothers once again give George Clooney the opportunity to show his comedic ability and as Baird Whitlock he provides many a laugh. Clooney's Whitlock has the movie idol appeal while on set, but comes across as a less than intelligent being away from the camera which produces much hilarity. He comes in contact with a group not unlike the Hollywood 10, who were a group of screenwriters and producers in the 1950's that were Communist sympathizers (and who were also featured in the recent film, Trumbo). Although Clooney is marketed as the member of the cast generating the most laughs, Alden Ehrenreich undoubtedly has the best comedic moments of the film. Ehrenreich plays Hobie Doyle, a young star of westerns who is given the news that the studio has decided to change his image and make him into a dramatic actor. He is also given instructions by Capitol to take actress, Carlotta Valdez (who, although her name is the same as the ill-fated women in Alfred Hitchcock's Vertigo, is a character much like Carmen Miranda) to his movie premiere as his date, although he has never met her before. Hobie is a product of the studio system, where studios determined who they wanted their stars to be, how they were marketed and, in this case, who they dated. This was a system that would not always ensure success for their stars, as is shown in Hail, Caesar! with Hobie and his difficulty to transition into a serious actor with no warning. Ehrenreich is absolutely wonderful as Hobie as he generates a great deal of sympathy as a result of his terror not wanting to disappoint. With his natural comedic ability, he is so likable and relatable and manages to outshine many of his more well known co-stars. Old Hollywood enthusiasts will jump on the obvious resemblance of Scarlett Johnasson's DeeAnna Moran to musical water baby, Esther Williams. Her mermaid sequence pays tribute to the Busby Berkeley musicals with their aerial shots and is truly exquisite with it's beautiful colours and costumes. Yet, when DeeAnna opens her mouth her resemblance to Williams ends there. DeeAnna is at the centre of a public relations nightmare and her case is the type of predicament which Hollywood fixers were hired to work on. DeeAnna's problem and the solution given by Mannix is actually very similar to what resulted from a flirtation between Loretta Young and a married Clark Gable in 1935 while they were filming The Call of The Wild together. Channing Tatum as Burt Gurney channels Gene Kelly during his song and dance routine, which is incredibly funny and entertaining. Tilda Swinton portrays both Thora and Thessaly Thackery, a particularly Coen-esque creation where twin columnist sisters are both competing to get the big scoop. The rivalry of Thora and Thessaly is much like the rivalry between Hedda Hopper and Louella Parsons, two old Hollywood gossip columnists who competed with each other over the big scoops from the studios. Swinton's characters display attributes which the two women both had, especially the ability to manipulate and blackmail in order to obtain the information they needed. It was important that the studio executives keep these two on their side and fed them newsworthy information, because being on their bad side could mean disaster for the studio and their stars. Hail, Caesar! is genius in the way it incorporates so much of old Hollywood. It is an incredibly fun piece of cinema that pays tribute to the past in the most entertaining and enjoyable of ways.